Have you ever seen one of these? They come in a variety of colours, the most common of which are orange and red, but yellow and purple, pink, white and brown [chocolate!] are also available. Sitting innocently on the supermarket shelf near the bell peppers, I assumed, in my ignorance, that they were dwarf capsicum, small enough to sit in the palm of my hand. Nothing on the packaging left me any the wiser, so I tossed them into the shopping trolley to jazz up our stir fry with a little colour. As I sliced up the onions and marinated the beef, some inner voice must have warned me to limit the number of orange habaneros I added. Nonetheless, the effect was scary. According to Wikipedia the habanero chilli is one of the most intensely hot species of chilli peppers in the Capsicum genus. Originating in northern South America, chilli is the Aztec name for the fruit of the Capsicum annuum, and it has been an important condiment in Mexico for thousands of years. Spanish conquistadores noted that the locals ate it both raw and cooked – stewed, boiled or roasted – and that the Peruvians were so fond of it, they would eat nothing without it. The chilli travelled east to the Caribbean with the South American Indians. Columbus, heading west in search of spices, discovered it in the East Indies, and named it pimiento: pepper. Despite this misnomer, Columbus successfully introduced this hot little fruit to Spain. Since then, it has travelled the world with saucy verve, to land up in Manila in my stir fry. 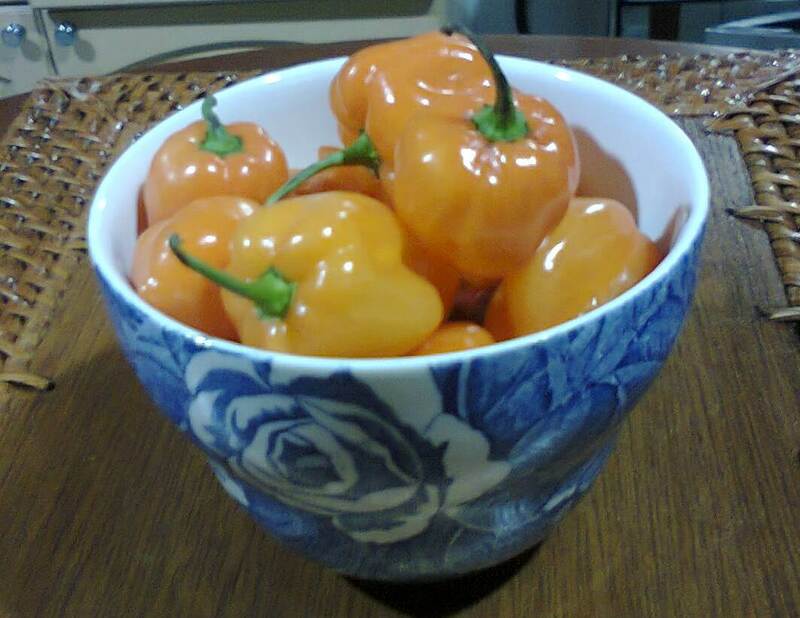 Ripe habanero is 2–6 centimeters (1–2½ in) long. Today, the crop is widely cultivated near its origins, on the Yucatán Peninsula in Mexico, but the name habanero comes from its jaunt to La Habana (Havana) in Cuba. While researching this bawdy little plant, I discovered there is even a scale for measuring the ‘hotness’ or pungency (spicy heat) of chilli peppers. Scoville heat units indicate the amount of capsaicin present, a chemical compound that stimulates chemoreceptor nerve endings in the skin, especially in the mucous membranes. Thus, a sweet pepper or bell pepper, containing no capsaicin at all, has a Scoville rating of zero, while habaneros will rate between 200,000 and 300,000 Scoville units. A jalapeno is a mere 3,500-8,000 units. While the results are subjective, I can only assume from this rating that the habanero is very, very, very, very hot! So let me warn you now, if you haven’t already discovered it, that despite the appealing colour, those orange habaneros are frighteningly fiery, and should be labeled with skull and cross bones. After throwing a handful into the wok, I misguidedly rubbed my eyes. I thought my eyeballs were going to ignite. I have never known such pain. The skin around my eyes and cheeks turned flaming red, my eyeballs were bloodshot and bulging. My sympathetic son said I looked like a Vampire, but he only caught a glimpse before I had my face under the cold tap. In despair at killing the pain, I eventually resorted to filling the sink and immersing my entire face beneath the water… for about half an hour. I have since learned that milk is also a good cure if applied gently to the eyes. It certainly worked on our mouths. Having removed every last skerrick of orange chilli (dwarf capsicums indeed!) from the wok, we discovered that it had nonetheless spiced up the stir fry in no uncertain terms. While our son emptied a carton of milk down his throat, I was scooping tablespoons of yoghurt into my mouth. My One & Only, the brave soul, loved it. Interestingly, once the pain cleared, I felt I could actually see better than before, but that may have simply been the relief of not going blind. However, my Filipina helper, Phoebe, tells me that a dash of chilli is renowned for clearing the vision, so I now have the proof of a little piece of Filipino folklore. And be wary. A little habanero goes a very long way! This entry was posted in Food & Wine, Philippines and tagged capsicum, chilli, Columbus, habanero, hot, South America. Bookmark the permalink.